What your skin is trying to tell you. Diving into an article about skin health is similar to jumping into a rabbit hole. It’s not 100% straight forward and there are many causative factors. That being said, I feel like the information that I do know about skin health is important to share because it’s completely transformed my life and the life of many of my clients. The above picture was a photo taken of me a few weeks ago. I have no make up on my skin, so what you see is what is real. Now I know that my skin is not completely flawless. I have definitely seen better on social media. BUT, my skin is flawless for me and I am completely content with it. For years, I battled adult onset cystic acne. And by years, I mean for over a decade! My acne was one of the biggest contributing factors to my commitment and study of health. I was determined to heal the root cause because I knew without a doubt that there was an internal factor that I was missing. I was completely correct. Unfortunately, it just took me a very long time to decipher the messages my body was giving to me. My hope is that if you are struggling with a skin disorder that you are able to take this information and use it to make the shifts you need to create transformation. Skin in Oriental Medicine is ruled by the Metal Element. The Metal element is one of 5 elements that influence all of life and health. (you can read more about this in my ebook A Quick Guide to Eating with the Elements). The organs associated with the Metal element are the Lung and the Large Intestine. This cues us to look at the health of both of these organ systems. For example, in Asia eczema is called 'skin asthma,' due to the fact that many of the children with eczema will also develop, or already have, asthma. Typically when one organ system is affected, it will show up in other associated organ systems. This is also true when treating. When one organ system is treated, typically the other will clear as well. So if the asthma is treated, the eczema will clear and vice versa. A good place to start with a skin disorder is to ask yourself how is the health of my lungs? What is my gut health like? In my clinical experience, I have found that most skin disorders will have a gut health component. Other causative factors in Oriental medicine for skin disorders is dampness or heat. The term 'heat' refers to distress in the body which can be caused by overwork, emotional stress (such as jealousy or anger), and/or over-activated hormones. The insufficient flushing of waste and toxins from the body, as well as water retention, and a humid or moist environment can cause 'dampness' in a person. Dampness has also many times been translated in the gut microbiome as dysbiosis or overgrowth of bacteria, parasites or fungi. Heat can also be translated as inflammation. So you can easily see how dampness and heat could have an impact on gut health. The best ways to decrease dampness and heat in the body is to focus the diet on whole unprocessed foods. Limiting processed foods, sugar, dairy, wheat, corn and soy. Also, making sure that 75% of each of your meals are vegetables. Stress reduction is also crucial. This includes emotional and environmental. Gut health is not the only factor in skin health, though I would say it is a big gun! Hormones play a role as well. This also includes the functioning of the liver. The liver performs about 200 vital functions, most of which are vital for good health. Detoxification of the blood, protein synthesis, excretion of bilirubin, hormones, cholesterol, drugs, and production of bile (an alkaline compound which helps in digestion through the emulsification of lipids). The liver plays a role in the digestive process which means that it will contribute to overall gut health. The liver produces bile, which helps in digestion through the process of emulsification of lipids. A sluggish liver produces less bile, causing many digestion problems. The liver plays an important role in eliminating toxins from the body and maintaining the efficiency of the body’s immune system. A few ways to insure that you are keeping your liver health and happy are to follow the gut health dietary suggestions. Exercise regularly. Avoid drugs, alcohol and other toxins. 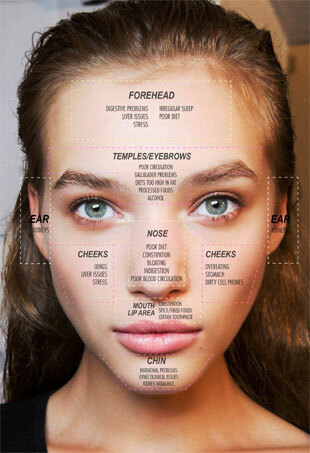 The Chinese face map can be very useful when wanting to decipher more information that your body may be giving you about your internal health. In a traditional face map, the parts of the face are broken down into organ systems such as liver, lungs, kidneys etc. But unless you have studied Oriental medicine, that information will not translate easily for you. The image below is a good description of causes. When looking at your complexion in the mirror, you can look for blemishes, psoriasis, eczema, dry skin, redness etc and then use the map to see if the suggested correlations make sense for you. Remember that with skin disorders (and any health issue), there is no one size fits all approach. The last approach to skin health is typically the first aspect that most people address. Most people attempt to heal skin conditions through topical treatment. In my experience, that is literally and figuratively the most superficial aspect of the problem. Skin conditions are almost always an INSIDE problem. That being said, topical treatment is a great adjunct therapy. First, it is good to know that your skin has a microbiome of it’s own. The skin is the human body’s largest organ, colonized by a diverse milieu of microorganisms, most of which are harmless or even beneficial to their host. It is important to have healthy diversity of these microorganisms to have healthy skin. Without diversity, it leaves the skin susceptible to bacterial and fungal overgrowths. Ways to insure this healthy diversity of the skin microbiome is to treat the skin gently. I personally recommend that soap is not used on any part of the body except for the pits and privates. Oil cleansing the face and body allows for the natural health bacteria to thrive and also utilizes beneficial oils that penetrate deep into pores to dissolve grime and build-up. For my body, I dry brush in the morning then do a self massage (abhyanga) with a sesame oil with ashwagandha, which is a soothing nervine that can help anxiety, fatigue, and stress. Then I take a warm bath or shower and wipe off any excess oil with a towel. My skin is left clean, hydrated and soft. For my face, I do something very similar but I use products from a London based company called de Mamiel. I wash my face with their oil cleanser. Wipe extra off with damp wash cloth. Then use toner and face oil. Again, my face is left glowing, hydrated, and supple. Soap never touches my face. Remember your skin and gut microbiome are also connected (think the Metal element!) No part of the body’s microbiome exists in a vacuum, which is why it is important to continue to understand the different parts of the biome and how they interact. The skin is home to trillions on lymphocytes that interact with the rest of the immune system via lymph nodes. Just like the bacterial organisms in the gut, they comprise a valuable part of the immune system. I hope that this information was useful for you. Again, remember that there is no one size fits all approach but I definitely feel that this will get you started in the right direction. If you would like to dig deeper into the underlying causes of your skin disorders, I would be happy to help you. I am currently accepting applications for my next Inside Out Program where we address both gut and hormonal health, getting the root of chronic conditions. Email nancycrowell@flowingelements.com for more details.